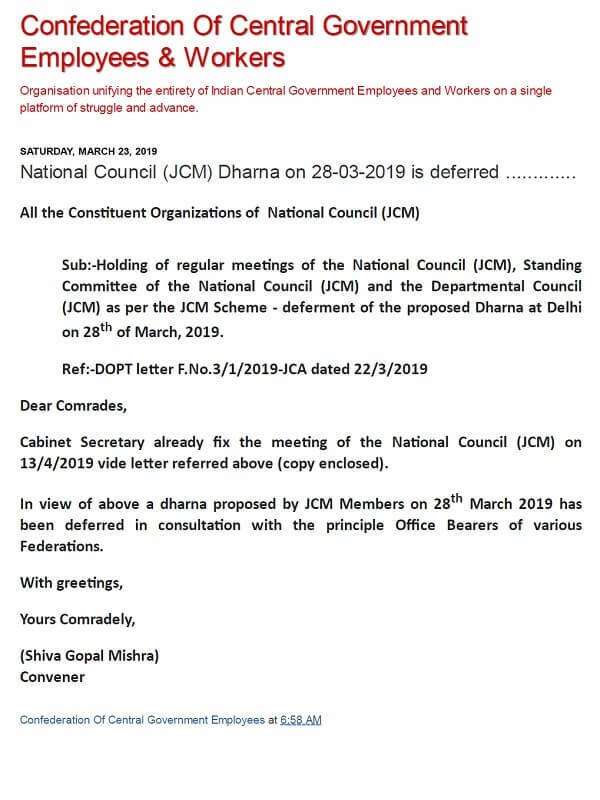 Sub:- Holding of regular meetings of the National Council (JCM), Standing Committee of the National Council (JCM) and the Departmental Council (JCM) as per the JCM Scheme – deferment of the proposed Dharna at Delhi on 28th of March, 2019. Cabinet Secretary already fix the meeting of the National Council (JCM) on 13/4/2019 vide letter referred above (copy enclosed). In view of above a dharna proposed by JCM Members on 28th March 2019 has been deferred in consultation with the principle Office Bearers of various Federations. 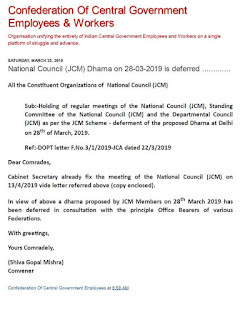 Holding of regular meetings of the National Council (JCM), Standing Committee of the National Council (JCM) and the Departmental Council (JCM) as per the JCM Scheme – deferment of the proposed Dharna at Delhi on 28th of March, 2019.